"In America too exists now the principal remnant of the Seventh Day Baptists. They have nearly disappeared in England though in the 17th century so numerous and active were they as to have called forth such writers as these who wrote treatises against them and about their Sabbath observance: Bishop White, Warren, Baxter, Bunyan, Wallace and others. In Holland were produced the two bulkiest defenses of Sabbatarianism that have ever been published, one in Latin by John Brown, an expatriated Scotsman who had been minister of Wamphray, entitled Controdia Antra anti Sabbatarios, and the other in Dutch by his friend, James Colvin, on the Controversy, history and manner of observance of the Sabbath and the Lord's day. In England the earliest considerable treatise on the Puritan side was the Sabbathan Beteri Anovita Testimoni of Dr. Nicholas Bound, a minister in Suffolk. It is written in English though the title is partly Latin. Many converts were made by it and the similar works of Greenham and Widely, his contemporaries. But until the Seventh Day Baptist, Brabourne, aroused in 1632 the indignation of the bishops, little noise seems to have been made throughout the nation of the controversy." "Nor would it perhaps have attained much prominence had not Charles I committed in 1633 the blunder and as the Puritans believe, the gross impiety of reviving his father's declaration concerning lawful sports to be used on Sunday. This the clergy were required by law to publish in their churches and many who refused to were punished severely; hence arose the greatest English controversy about the Sabbath between the high church party on the one hand and the Puritans on the other." "A still more eminent writer on the side, one with great breadth of view was Dr. Owen, whose exhortation concerning the day of sacred rest since prefixed to his exposition of Hebrews gave however some offense to his friends by suggesting that the duration of the religious exercise of the day should be measured by the stress of the worshipper. Since then the Sabbatarian cause has been maintained by numberless writers among whom may be mentioned Bishop Hopkins, Willison, Jonathan Edwards, Dwight, Hopford, MacFarland and others to be afterwards named, while the opposite side supported Baxter, Milton, Barrow, Barclay. Of the British Seventh Day Baptists, the principal works were those of Graber, Bampfield, Forthwait and Bernside." "The modern day representative of the Traskites. They have never been innumerous and at the present day, there are not above 40 or 50 in the whole country with two small meeting houses." So what God said in Revelation 3 happened. God said they had a name that they were alive, but they are dead. He said you'd better hold fast to what remained, or you will even die more. They have died all the way down to 40 or 50 members in England with two small meeting houses. In a picture of the church in Millyard do you think it has a steeple on it? Do you think it has crosses on it? Definitely not! "A community of the sect [notice sect, not denomination] was formed by an immigrant named Stephen Mumford in Newport, Rhode Island about 1681. And there are now said to be 50 congregations of them numbering 6000 members in the United States." I wonder what has happened to these, even in the United States. "In the year 1618, James I published for the county of Lancaster, a declaration of liberty sports and soon after appeared a sect of Sabbatarians, who were long known." Notice that, now this was in 1618 and if, as he says they were long known "under the name of their first teacher, John Trask." He wasn't their first leader in England. Walter Lollard was their first leader in England. John Trask was their first leader from among the English. Walter Lollard had come over to England from Germany. So in 1618, "after James I issued this declaration, a sect of Sabbatarians long known under the name of their first teacher, John Trask and also afterwards called Seventh Day men." Notice that, afterwards they were called Seventh Day men. They weren't called Seventh Day Baptists until 1818. They were called Seventh Day men. They were called Traskites. They were called Sabbatarians, but what was their name? Church of God, which we will prove a little later. Bradburn's "Defense of the Sabbath Day"
"In the year 1633 the controversy was revived by the publication of Bradburn's 'Defense of the Sabbath Day.' He maintained that the seventh day ought to be observed, and that the Lord's day is an ordinary working day. Before he was tried by the high commissioner, he was convicted of his error in a conference with White, Bishop of Eli. He was prosecuted and held guilty but his book occasioned the publication of the kings's declaration regarding sports and the order that it should be read in all churches." "They assert that the change from the seventh to the first day of the week was effected by Constantine on his conversion to Christianity A.D. 321." So that is the stand of these Sabbatarians in England, that the Sabbath was changed from the seventh to the first day by Constantine on his conversion to Christianity in A.D. 321! "The three following propositions contain a summary of their principles as to this article of the Sabbath by which they stand distinguished. 1. That God had required the seventh or last day of every week to be observed by mankind universally for the weekly Sabbath. 2. That this command of God is perpetually binding on man till time shall be no more." You see, that the Sabbath was made for man, not the Jews, not for the Israelites, but for man. 3. That this sacred rest of the seventh day Sabbath is not by divine authority changed from the seventh and last to the first day of the week and that the scripture does nowhere require the observance of any other day of the week but the seventh day only. They hold in common with other Christians the distinguishing doctrine of Christianity." Downhill the Number Goes as the Church Weakens! "This people has in the United States about 48 churches, 34 elders, 20 licentiates and 5000 communicants." Five thousand! Now they have only 5000. "They reside principally in Rhode Island and New York but have a few churches in New Jersey and Pennsylvania. They are divided in three associations and meet by delegation annually at general conferences." Notice how they meet! They don't have the ministers meet, as in Acts 15, but they meet at delegation. Is that they way God governs His church? "Their government, however, is independent." Each church independent of the other. This is not the system of church government in the New Testament. "They have general missionary societies, a society for the promotion of Christianity among the Jews, a tract and education society. Their principal institute of learning is at Derider, New York, and is in a flourishing state, having several teachers and about 200 scholars. This means you have to be a member before you can take the Passover with them. "The Seventh Day Baptists missionary society. The operations of this society are confined to the occasional assistance of destitute churches at home." That's as far as their missionary society goes. Occassional assistance of destitute churches at home. "The Seventh Day Baoptists assumed their present denominational form." Notice, even he admits that their being a denomination and their present name was something they assumed. "The Seventh Day Baptists assumed their present denominational form as Sabbatarian Baptists in England under the English Reformation. Their distinctive doctrines were first preached by John the Baptist." "Christ, not as a Jew but as Christ, set the example for all His followers. Sabbath keeping as obedience to God's law and baptism as the symbol of new life after repentance are fundamental facts in the history of New Testament Christianity." And there is a very unique way of putting one good point. Christ, not as a Jew but as Christ, as the first Christian, set the example for His followers by Sabbath keeping in obedience to God's Law, by being baptized not as a Jew was He baptized, but as the first Christian He was baptized! "In these facts the Seventh Day Baptists find the warrant for their doctrinal denominational existence. In all these points they claim to be identical with the New Testament Church." You see, they claim to be identical with the church of Paul's day, the church of Acts, the church of Corinth, Philippi, etc. "History. There has been no period since the time of Christ when there were not Sabbath keeping Christians previous to the middle of the second century. Sabbath keeping continued even in the Western church as late as the fifth century and in the Eastern until the 15th or later. Since Sabbath keepers denied the authority of the organized church they were persecuted as heretics by the papal power." This is the history according to the Seventh Day Baptists of themselves. "Their earlier history coming through the hands of their enemies has been boldly destroyed or much distorted. As the Western church drifted into papacy, these dissenters were known as Nazarenes, Cyrinthians and Hypsastari, and they were stigmatized as Judaizers. Later they were known as Vaudois, Cathari, Talutians, Petrobrusians and Waldenses." Notice now, in their own Seventh Day Baptist history, where they trace their history. "They were not wholly uniform in doctrine and practice." The Baptists of England were totally separated from the Seventh day keepers, who were called Traskites, Sabbatarians. They were never called Baptists until 1818, or in England, a title earlier. "They formed the irregular but never wholly broken chain between the New Testament and the modern Seventh Day Baptists." Notice that! The irregular, but never wholly broken chain between the New Testament and the modern Seventh Day Baptists. "Sabbath keepers in the Eastern church were not disturbed by the papal power and were far more numerous than in the West." And that is why you had the Paulicians and the Bogomils in the East. Finally after the persecutions began to let up a little, they came on over into Italy. "When the Romish church attempted to proselyte the Abyssinians in the 17th century, they found the Abyssinians observed the Sabbath and ready to take up arms in the Sabbath's defense. They had allowed it from time immemorial. The Armenian church was founded as early as 302 A.D. From that time until English missionaries entered Armenia early in the present century, Sabbath keeping continued without interruption. The Nestorian or Chaldean Christians have also continued their original practice of Sabbath keeping through the present century. "And there is every reason for believing that the Sabbath is still kept in these three branches of the church except where modern missionary influence has modified or set it aside. These facts are of great importance as showing what the earliest practice was and what it has continued to be where the papal has not power to repress it. When the darkness of the Middle Ages began to recede before the light of the Reformation scattered Sabbath keepers appeared at different points. Their history linked with those who had died for their faith and obedience to the law of God during the Dark Ages makes the chain complete. Sabbath keepers increase as the spirit of reform spread among the people. At first they were prominent in Bohemia, Transylvania and Holland. Dr. Hessey calls the Bohemian Sabbath keepers the denominational ancestors of the present Seventh Day Baptists." They were the ancestors, but they didn't have the name, Seventh Day Baptists, but the Sabbath keeping Bohemian Bogomils were the ancestors of the present Seventh Day Baptists. "During the Reformation in England, Sabbath keepers were among the representative men of the times. Their writings and sufferings formed an important factor in the history of those years." In any 17th century history of England, you will read a lot about the Sabbath keepers, Sabbath debates, and Sabbath problems. "John Trask, William Hillyard, Christopher Sands, Rev. Mr. Wright, and — Hebden were among those who were prominent between 1600 and 1630 A.D. Trask was whipped, and imprisoned under sentences by the infamous Star Chamber. His wife was condemned because she refused to teach school on the Sabbath. She lay in prison 15 or 16 years for her opinions about the Saturday Sabbath. She was a great sufferer, dying at last in prison and was buried in the open fields." "The influence of the Seventh Day Baptists was a prominent factor in forcing the Puritans to adopt the change of day theory which gave birth to the Puritan Sabbath." That's when the word Sabbath began to be applied to Sunday. All the way up until the 1600's, it never was applied to Sunday. They never did call that the Sabbath. They never did say you had to keep Sunday as the Sabbath of God's law. But the influence of the Seventh Day Baptists was a prominent factor in forcing those Puritans to adopt the change of day theory. "Afraid to remain upon the 'no Sabbath' platform of the church party and of the continental reformers and not radical enough to accept the Sabbath with the Seventh Day Baptists, the Puritans sought this middle ground of compromise. This change of day theory was published by Nicholas Bound of Norfolk, England, 1595 to 1606 A.D. A number of Seventh Day Baptist churches were organized in England between 1600 and 1700 A.D. Three of these were in the city of London. The Millyard church still holds regular Sabbath services." "This congregation was first gathered by Rev. John James, date unknown from loss of records. On October 18, 1661 Mr. James was arrested in his pulpit, tried and condemned on the falsehood of treason, a procedure not uncommon in those days in order to get rid of men whose religious and reformatory views could not be accepted otherwise. He was hung, drawn and quartered. After he was dead his heart was taken out and burned. His quarters were affixed to the gates of the city and his head was set up in white chapel on a pole opposite the alley in which his meeting house stood." "Churches in America. These were the result of immigration from England. Stephen Mumford of London came to Newport, Rhode Island in 1664. He united with the Baptist church though a Sabbath keeper. Others embraced the Sabbath and the first Seventh Day Baptist church in America was organized at Newport in 1671." Now how could that be if they didn't adopt the name Seventh Day Baptist until 1818? Roger Williams founded the state of Rhode Island on the grounds of religious freedom. That's how it came to be the smallest state. It was just a refuge for persecuted Christians who wanted to be free to practice whatever religion they had. After Roger Williams saw what a confusion and intolerance this produced he became disappointed in these churches and was baptized by one of these followers of Stephen Mumford. He was baptized by a Seventh day keeper. This is stated right in the Encyclopedia Britannica, eleventh edition. He was baptized by an Anabaptist. The Anabaptists in America were Sabbath keepers. "Stephen Mumford came to Newport, Rhode Island in 1664. The first Seventh Day Baptist church was organized in America in 1671. A second branch was founded by Abel Noble near Philadelphia about 1700. A third was founded in Northern New Jersey, 19 converts from the Cuscatowa Baptist church in 1705. From these three points, the denomination has spread slowly through the United States. In 1818 the general conference adopted Seventh Day Baptist 'instead of Sabbatarian' as the denominational title." Church policy. This is a pure congregationalism. Notice the kind of government they had: congregational government. They didn't know God's true government. When the Church of God split out from among the Seventh Day Baptists, they didn't know a thing about Church government. 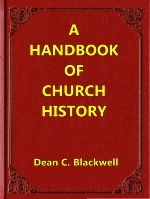 In The True History of the True Church by Dugger and Dodd, you read how they thought it should be. They said, "We've got to have twelve apostles." So they threw their names in a hat and drew out the names of the twelve apostles. We didn't know about church government until Dr. Hoeh after several years of study came up with the points in the Bible and the history that the Church should be governed by theocratic government. This pyramid is from God, through Christ, and then through the one man God chose to originate the work, and then going down from there to evangelists, pastors and right on down the line. "Each church is an independent democracy. Associations and general conferences have only advisory powers. Ordained officers are pastors, deacons and evangelists." So they followed the regular denominational churches. They only had pastors, deacons and evangelists. For the first time in centuries all the offices in God's church government were called in this era only as recently as 1955. Miss Mann was ordained as a deaconess, and a number were ordained as pastors. This is the first time in centuries that the Bible given offices in Ephesians 4 and Romans 12 were completely filled in. "The Seventh Day Baptists are strictly evangelical in the sense of that term. They are necessarily radical reformers. Ernest advocates of freedom, equality, temperance, purity, universal education, Bible schools." They had Bible schools when Mr. Armstrong came into the church. After Mr. Armstrong was a minister for a while, they had Bible schools until he found out that it was the invention of man and not scriptural. "A. The ten commandments enunciate eternal and universal truths. They spring from man's relation to God and his fellows." So you see, they knew the ten commandments were, the first four your relation to God and the last six your relation to your fellows. They knew that the ten commandments are universal truth and eternal truths. "They must continue while these relations continue." So as long as man is in existence as God is in existence, then he has to obey these laws. "B. Christ came not to destroy the law but to fulfill it by complete obedience. He and his disciples." Would you say by that that they are like all other Baptists except for the day they keep? "He and his disciples kept the Sabbath, purged from Judaists' falsities. The New Testament church did the same. Thus purified, it is the true Christian Sabbath. They reject no Sabbatism for the above reasons and also because a few passages from the epistles which are adduced to prove the abrogation of the Sabbath cannot include the weekly Sabbath which existed before Judaism and was not a shadow of Christ." "C. They reject Sunday because the New Testament never alludes to a change of the Sabbath. It never speaks of Sunday as a sacred day or as commemorative of any event or as connected in any way with the Sabbath question. It does state that 'Christ rose late in the Sabbath.'" That the Seventh Day Adventists never have believed. The Seventh Day Adventists have also believed in a trinity. "Christ rose late in the Sabbath before sunset, Matthew 28:1." The men who wrote this knew even the accurate translational meaning of Matthew 28:1! "And in all the first day of the week, according to tradition, the phrase 'the first day of the week' occurs in the Bible but eight times, six of these refers to the same day, the one on which the resurrection was announced to the disciples. There is but one reference to it in the book of Acts and one in all the epistles so there are but three distinct references to the first day of the week in the New Testament. On the other hand, the Sabbath in its appropriate character is mentioned at least 50 times in the New Testament alone." "They also reject Sunday because it came into the church as a semi-pagan holiday and the temporary sacredness which it attained during the Puritan Reformation has been necessarily lost and is rapidly returning to its native holiday connection even in the United States. Seventh Day Baptists believe that the church will be forced to choose between a return to the Bible Sabbath and being overwhelmed by no Sabbatism." "To avoid misapprehension it ought to be stated that the Seventh Day Baptists are in no sense legalists or Judaizers. They simply accept the Sabbath as made for man, as ante-dating Judaism and the formulating of the law at Sinai, as covering all dispensations and continuing through all time. They deemed it no more Jewish than the law against murder or profanity. They are not illiberal toward others. They claim and grant the right of private judgment and foster free discussions, holding that every man is judged according to the light he has. They proclaim the Sabbath as an essential part of the complete gospel and the only remedy for the flood of no Sabbatism under which Sunday is being buried. They look for marked changes in the church through the agitating influences now at work." "In respect to this they believe that the seventh day of the week was sanctified and blessed for the Sabbath in paradise and was designated for mankind, that it forms a necessary part of the ten commandments which are immutable in their nature and universally binding, that no change as to the day of the Sabbath was made by divine authority in the introduction of Christianity, that those passages in the New Testament spoke of the first day of the week do not imply either the substitution of that day for the seventh as the Sabbath or its appointment as a day of religious worship, that whatever respect the early Christians paid to the first day of the week on the supposition of its being the day of Christ's resurrection yet they have never regarded it as the Sabbath but continued to observe the seventh day in that character until by the edicts of emperors and the decrees of councils the first day was made gradually to supercede it." So you notice a lot of these things here are quoted in these other books. But they only quote parts out of this book. "The Seventh Day Baptists think there is no difficulty in proving the antiquity of their sentiments. Indeed they believe there has been no period since the commencement of the Christian era when there were not upon the earth more or less Christians observing the seventh day. That the apostles observed that day as the Sabbath, there can be but little doubt. In their writings they uniformly distinguish between the Sabbath and the first day of the week. In consistency with this distinction it was their custom to rest from labor and engage in religious exercises upon the seventh day. The women who were present at the crucifixion and were preparing their spices rested according to the commandment." "When Paul was at Antioch, he preached on a certain Sabbath day and so interested his Gentile hearers that they requested him to preach the next Sabbath day. Nearly the whole city came together to hear him. At Corinth he reasoned in the synagogue every Sabbath day for nearly a year and a half." "On one occasion in addressing the Jews Paul asserted that he had committed nothing against the customs of their fathers who are known to have been strict observers of the seventh day and though the Jews were ever on the watch to discover any discrepancies between the practices of the early Christians and the customs of their own people they are not known in a single instance to have charged them with the neglect or violation of breaking the Sabbath." That's true. You might be thinking of where they accused Christ of breaking the Sabbath, but they didn't the disciples. "Different circumstances in connection with the facts which have been stated sufficiently establishes the position that it was the practice of the apostles to observe the seventh day. Passing from inspired history to that which is uninspired, we find frequent notices of Sabbath keepers during the first six centuries of the church. Mosheim mentions proof of this in the second century. Indeed the notion that a change had been introduced as to the day on which the Sabbath should be observed seems not to have been entertained even. In process of time however, a custom arose of celebrating the resurrection of Christ by a religious meeting on the first day of the week. No historical record, sacred or profane, has informed us of the first celebration of this day nor is there any certain evidence that it was at first observed weekly. It seems to have been introduced as a voluntary festival to commemorate the resurrection just as the sixth day was observed to commemorate the crucifixion." "The fifth day to commemorate the ascension. Though not regarded as the Sabbath it gradually grew in estimation of Christians during the first three centuries. In the fourth century the emperor Constantine embraced Christianity and in his zeal to magnify those institutions which were regarded as peculiarly Christian and to bring into disrepute those which were not in any way connected with the Jews, he set himself at work to give importance to the first day of the week." This is the most detailed account of how the change took place that you will ever read! "He required his armies and the people generally to spend the day in devotional exercises." Another thing the Britannica points out is that for three years Constantine forced Sunday on the nation before he saw the cross in the sky; before he became a "Christian," so called. He had that as the insignia of his armies three years before he was ever baptised. He adopted the Sunday worship of the Pagans who were sun worshippers. That is why he instituted sun, or Sun-day, worship. "No courts of judicature were to be held on this day and no suits or trials in law prosecuted. Certain works of necessity or mercy however were declared lawful. Such for instance as the emancipation of slaves, the labor of husbandmen in pleasant weather. His decrees were subsequently confirmed and extended by Christian emperors. And similar decrees were passed and enforced by the various ecclesiastical councils. While the civil and ecclesiastical powers were making such efforts to establish the first day they were equally zealous to abolish the observance of the seventh day, which they endeavored to do by throwing odium upon those who persisted in it. In his decree in 321, Constantine speaks of the Sabbath as a Jewish institution and represents those who observe it as giving countenance to the Jews and says, 'Let us have nothing in common with that most odious brood, the Jews.' [However, this council in 321 A.D. termed Sunday "The Venerable Day of the Sun!"] The Council of Laodicea about 350 passed a decree saying, 'It is not proper for Christians to Judaize and to cease from labor on the Sabbath, but they ought to work upon that day and put special honor upon the Lord's day. If any be found Judaizing, let him be anathematized.'" "Notwithstanding this opposition from the highest authority, many Christians continued to observe the Sabbath. Athanasius, A.D. 340, says 'We assemble on Saturday, not that we are infected with Judaism but only to worship Christ on the Sabbath.'" Sabbath Still Widespread — 440 A.D.
"Reverend Poleman, instructor in ecclesiastical history in Auburn Theological Seminary, in a historical sketch of the Christian Sabbath published in the Theological Review, sums up the facts in regard to the early observance of the Sabbath and the Lord's Day as follows: 'Both were observed in the Christian church down to the fifth century, with this difference, that in the Eastern churches both days were regarded as joyful occasions but in the Western, the Jewish Sabbath was kept as a fast.'" They didn't want to be connected with those odious Jews, so they just fasted on their day.